Bourg-en-Bresse ([buʁkɑ̃bʁɛs]; Bôrg in Arpitan language) is a commune in eastern France, capital of the Ain department, and the capital of the ancient province of Bresse (Arpitan: Brêsse). It is located 70 km (43 mi) north-northeast of Lyon. Bourg-en-Bresse is located at the western base of the Jura mountains, on the left bank of the Reyssouze, a tributary of the Saône. It lies 70 kilometers (43 mi) northeast of Lyon and 50 kilometers (31 mi) south-southwest of Lons-le-Saunier. Roman remains have been discovered at Bourg, but little is known of its early history. 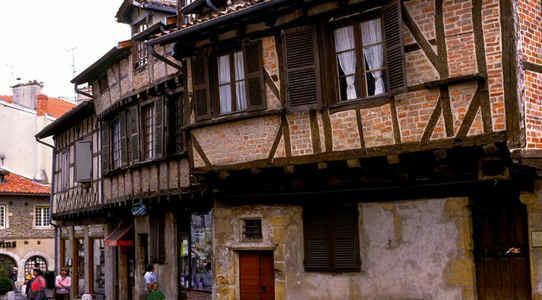 Raised to the rank of a free town in 1250, it was at the beginning of the 15th century the capital of the dukes of Savoy in the province of Bresse. In February 1535 it was conquered by France during a full-scale invasion of Savoy, but was restored to Duke Philibert Emmanuel in 1559, when he married Henri II's sister Marguerite. The duke later built a strong citadel, which afterwards withstood a six-months' siege by the soldiers of Henry IV during the Franco-Savoyard War of 1600–1601. The town was finally ceded to France in 1601. In 1814, the inhabitants, in spite of the defenseless condition of their town, offered resistance to the Austrians, who put the place to pillage. 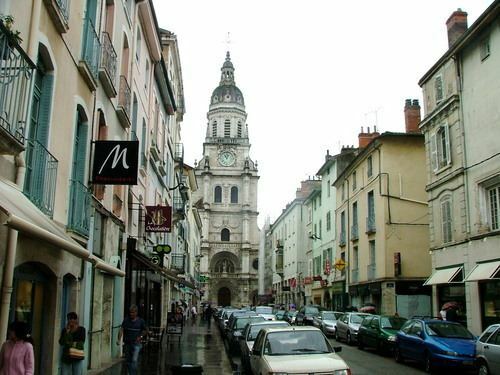 The church of Notre-Dame (Cathédrale Notre-Dame-de-l'Annonciation de Bourg-en-Bresse) (16th century) has a façade built in the Renaissance; other parts of the church are Gothic. In the interior there are stalls of the 16th century. The other public buildings, including a handsome prefecture, are modern. The town hall contains a library and the Lorin Museum with a collection of pictures, while another museum has a collection of old costumes and ornaments characteristic of Bresse. Among the statues in the town there is one of historian Edgar Quinet, a native of Bourg. The church of Brou, a suburb of Bourg-en-Bresse, is of great artistic interest. Margaret of Bourbon, wife of Philip II of Savoy, had intended to found a monastery on the spot, but died before her intention could be carried into effect. The church was actually built early in the 16th century by her daughter-in-law Margaret of Austria, wife of Philibert le Beau of Savoy, in memory of her husband. The exterior, especially the façade, is richly ornamented, but the chief interest lies in the works of art in the interior, which date from 1532. The most important are the three mausoleums with the marble effigies of Marguerite of Bourbon, Philibert le Beau, and Margaret of Austria. All three are remarkable for perfection of sculpture and richness of ornamentation. The rood loft, the oak stalls, and the reredos in the chapel of the Virgin are masterpieces in a similar style. In the early 20th century, the city manufactured iron goods, mineral waters, tallow, soap and earthenware, and there were flour mills and breweries; and there is considerable trade in grain, cattle and poultry. The Gare de Bourg-en-Bresse railway station offers connections to Paris, Strasbourg, Lyon and Geneva by high-speed rail, and several regional destinations. The A39 motorway connects Bourg with Dole and Dijon, the A40 with Mâcon and Geneva. Football Bourg-en-Bresse Péronnas 01 is based in the town. Bourg is the seat of a prefect and of a court of assizes, and has a tribunal of first instance, a tribunal and a chamber of commerce, and a branch of the Bank of France. Its educational establishments include lycées, and training collèges. Bourg-en-Bresse was the finish of Stage 6 and the departure of Stage 7 in the 2007 Tour de France.